The TC77 is a serially accessible digital temperature sensor particularly suited for low cost and small form-factor applications. Temperature data is converted from the on-board thermal sensing element and made available at anytime as a 13-bit two's compliment digital word. 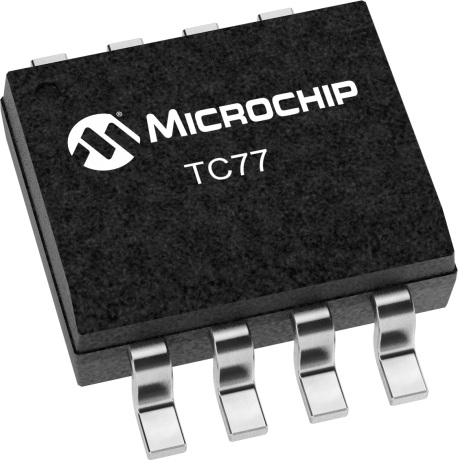 Communication with the TC77 is accomplished via an SPI/ Microwire compatible interface. The device features a 12-bit plus sign temperature resolution of 0.0625°C per LSB. The TC77 offers a temperature accuracy of +/-1.0°C (max) over the temperature range of +25°C to +65°C. The SHUTDOWN bits in the Configuration register can be used to activate the low power Standby mode (0.1 uA typical). When operating, the TC77 consumes only 250 µA (typ), 400 µA max. Small size, low installed cost and ease of use make the TC77 an ideal choice for implementing thermal management in a variety of systems. The TC77 Thermal Sensor PICtail Demo Board demonstrates how to interface the TC77 Thermal Sensor device to a microcontroller. This board can connect directly to the PICkit 1 Flash Starter Kit, providing a platform for code development and evaluation. The system designer will be able to use this design as an example of how to integrate a digital temperature sensor in their system.